We all know how easy it is for an NBA player to run out of money pretty quickly after retirement. It’s pretty simple actually. Those huge pay checks encourage the sort of unsustainable lavish lifestyle that only really works if you’re able to invest and save. Players like Kobe Bryant are renowned for their smart decisions when it comes to saving, whereas others like Allen Iverson…less so. Over the course of Iverson’s career he earned a staggering $200 million. $155m from his salary and another 40m-50m in endorsements. He allegedly traveled with an entourage of as many as 50 people at times. He showered friends and family, especially his mother, with cars, jewelry, houses and expensive vacations. Firstly, there’s always ways for celebrities to claim bankruptcy but that doesn’t necessarily mean they have no money. This is sometimes done in an effort to settle debts and start a clean financial sleight. However, in Iverson’s case, his bankruptcy was very much a by product of his spending habits. Aside from showering his entourage with gifts he couldn’t afford and including them in a lifestyle fit for a king, he apparently had a habit of keeping his money in dozens and dozens of garbage bags around his mansion. Some would occasionally go missing. At one point in his career he arrived back at an airport and had forgotten where he parked his car so apparently ditched the car and bought a new one. Allen’s financial situation came to light in 2012 after a judge ordered him to pay $900,000 to a Georgia jeweler but apparently Iverson didn’t have the funds to cut the check. – $125,000 goes to paying back various creditors and mortgages. Dude’s spending money on enough groceries to end world hunger but somehow manages to spend the same amount on restaurants…yet is still as skinny as ever. That is some sort of supernatural gift he has. So how has Reebok helped him? 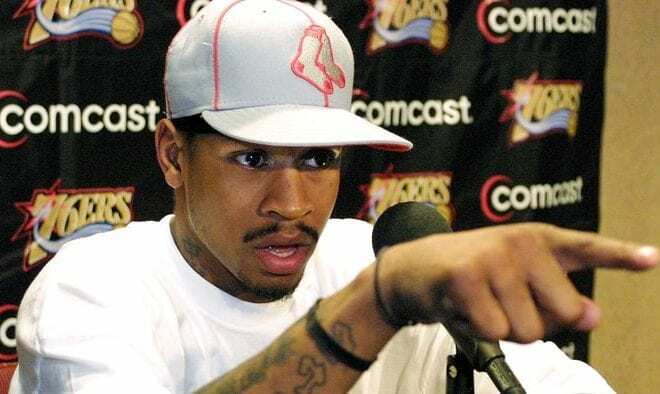 In 2001, Iverson made a decision that would inevitably save him from his future self. He signed a very unique endorsement deal with Reebok. In addition to paying $800,000 a year for life, Reebok set aside $32 million in a trust fund that Allen will not be able to access until he turns 55 in the year 2030. This deal came to light when Allen’s ex-wife filed for divorce. As a result of the divorce, Allen will inherit half the trust fund in 2030. NBC reported that his lump sum will be between $1.5 million and $1.8 million. Alternatively, he can elect to take monthly checks of approximately $14,000 per. The recently inducted Hall of Fame member just needs to play his cards right and sure enough he’ll be back in a pretty good spot again. However, he’ll need to keep those expenses down if he wants to make sure he never ends up broke again!